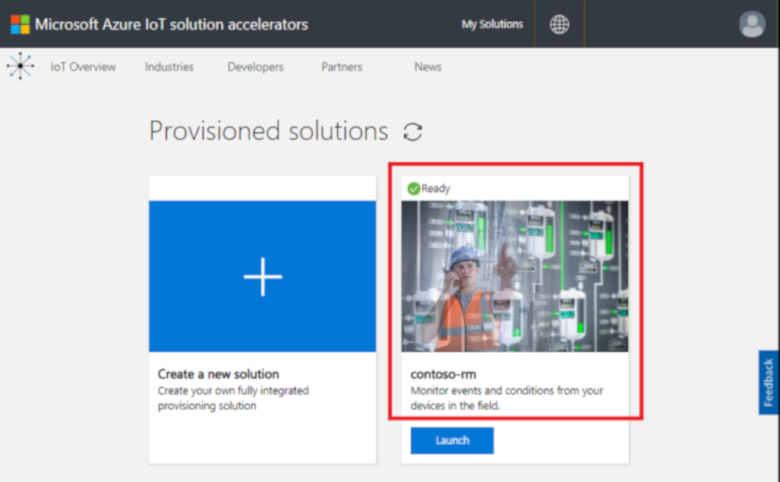 This quickstart shows you how to deploy the Azure IoT Remote Monitoring solution accelerator. 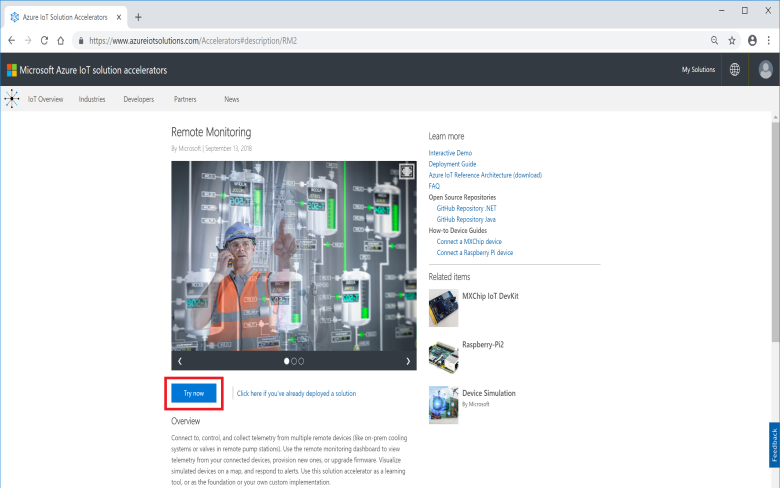 In this cloud-based solution, you use the Dashboard page to visualize simulated devices on a map and the Maintenance page respond to a pressure alert from a simulated chiller device. You can use this solution accelerator as the starting point for your own implementation or as a learning tool. The initial deployment configures the solution accelerator for a company called Contoso. As an operator at Contoso, you manage a selection of different device types, such as chillers, deployed in different physical environments. A chiller device sends temperature, humidity, and pressure telemetry to the Remote Monitoring solution accelerator. This quickstart deploys a Basic version of the solution accelerator for test and demonstration purposes that minimizes costs. For more information about the different versions you can deploy, see Basic and standard deployments. To complete this quickstart, you need an active Azure subscription. When you deploy the solution accelerator to your Azure subscription, you must set some configuration options. Sign in to azureiotsolutions.com using your Azure account credentials. Choose C# Microservices as the Deployment options. The Java and C# implementations have the same features. Enter a unique Solution name for your Remote Monitoring solution accelerator. For this quickstart, we're calling ours contoso-rm. 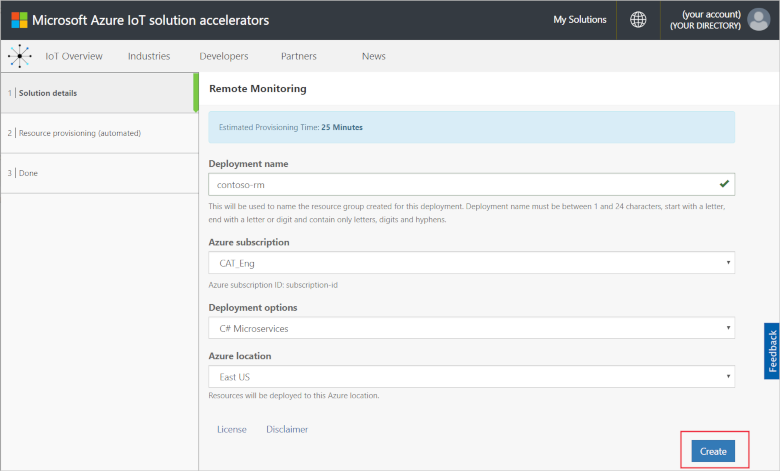 Select the Subscription and Region you want to use to deploy the solution accelerator. Typically, you choose the region closest to you. For this quickstart, we're using East US. You can choose Visual Studio Enterprise, but you must be a global administrator or user to do so. 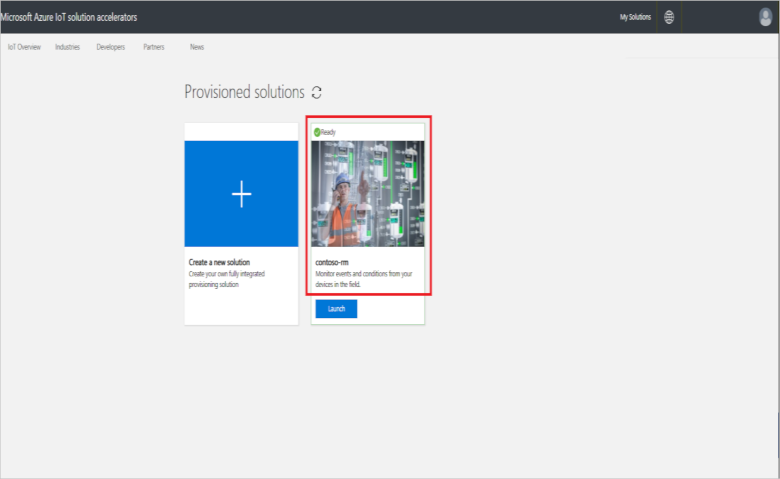 When the deployment to your Azure subscription is complete, you see a green checkmark and Ready on the solution tile. You can now sign in to your Remote Monitoring solution accelerator dashboard. The Device statistics panel shows summary information about alerts and the total number of devices. In the default deployment, Contoso has 10 simulated devices of different types. The Device locations panel shows where your devices are physically located. The color of the pin shows when there are alerts from the device. The Alerts panel shows details of alerts from your devices. The Telemetry panel shows telemetry from your devices. You can view different telemetry streams by clicking the telemetry types at the top. The Analytics panel shows combined information about the alerts from your devices. As an operator at Contoso, you can monitor your devices from the solution dashboard. The Device statistics panel shows there have been a number of critical alerts, and the Alerts panel shows most of them are coming from a chiller device. For Contoso's chiller devices, an internal pressure over 250 PSI indicates the device isn't working correctly. 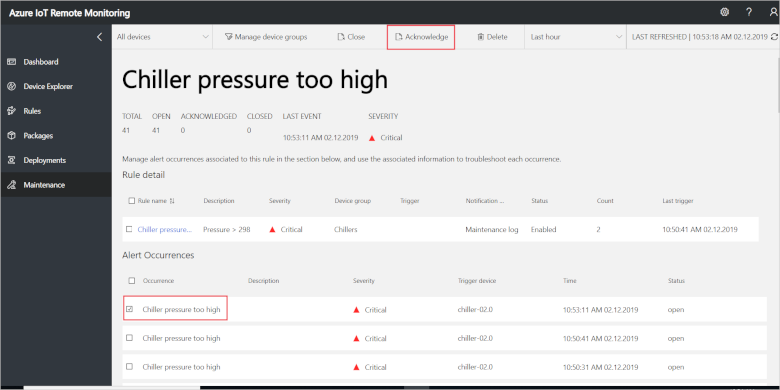 In the Alerts panel, click ... in the Explore column next to the Chiller pressure too high rule. This action takes you to the Maintenance page where you can view the details of the rule that triggered the alert. You've now identified the issue that triggered the alert and the associated device. As an operator, your next steps are to acknowledge the alert and fix the issue. The value in the status column changes to Acknowledged. In the Jobs panel, choose Run method and then the EmergencyValveRelease method. Add the job name ChillerPressureRelease, and click Apply. These settings create a job for you that executes immediately. The value in the status column changes to Closed. In this quickstart, you've deployed the Remote Monitoring solution accelerator and completed a monitoring task using the simulated devices in the default Contoso deployment. To learn more about the solution accelerator using simulated devices, continue to the following tutorial.